Sit comfortably with your spine straight and focus your attention your perineum. Form a circle with your forefingers and thumbs. Rest your hands on your knees with palms up. Inhale deeply and as you exhale chant the mantra LAM three times. (Suggested musical note- C). Repeat for 7 to 10 breaths. Sit comfortably with your spine straight and focus your attention on the area one-inch below your navel across to lumbar vertebra one. Rest your right hand over your left with the palms up, in your lap with thumbs touching lightly. Inhale deeply and as you exhale chant the mantra VAM three times. (Suggested musical note- D). Sit comfortably with your spine straight and focus your attention on the area of your navel to solar plexus and across to thoracic vertebra eight. With your fingers straight, touching at the top and pointing forward, form a V with your thumbs crossed right over left. Inhale deeply and as you exhale chant the mantra RAM three times. (Suggested musical note- E). Sit comfortably with your spine straight and focus your attention on the area of your heart across to thoracic vertebra one. Form a circle with your forefingers and thumbs. Rest your left hand palm up on your left knee. Raise your right hand up to the center of your breasts with palm angling slightly toward your heart. Inhale deeply and as you exhale chant the mantra YAM three times. (Suggested musical note- F). Sit comfortably with your spine straight and focus your attention on the area of the base of your throat across to cervical vertebra three. Form a circle with your thumbs touching and the rest of your fingers crossed and loosely cupped. 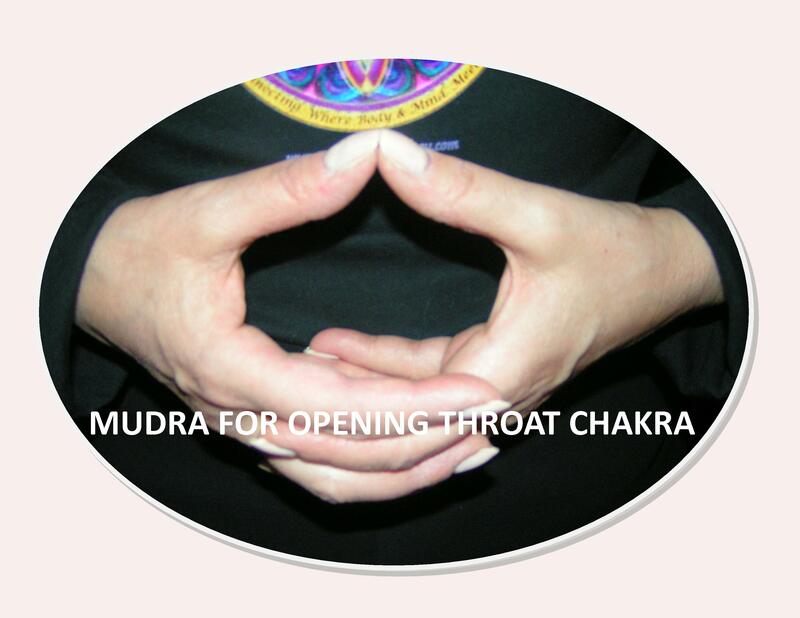 Raise your hands in front of your throat, solar plexus, or rest them on your lap. Inhale deeply and as you exhale chant the mantra HAM three times. (Suggested musical note- G). Sit comfortably with your spine straight and focus your attention on the area of your third eye, beginning slightly above the point between the eyebrows across to cervical vertebra one, encompassing the skull’s interior. Form a heart with your thumbs touching at the tips and your forefingers, ring and pinky fingers touching at the second phalanges. Raise your middle fingers to form a crown. Raise your hands in front of your third eye, solar plexus, or rest them on your lap. Inhale deeply and as you exhale chant the mantra OM three times. (Suggested musical note- A). Sit comfortably with your spine straight and focus your attention on the area of your crown at the top of your head up and to three inches above your skull. 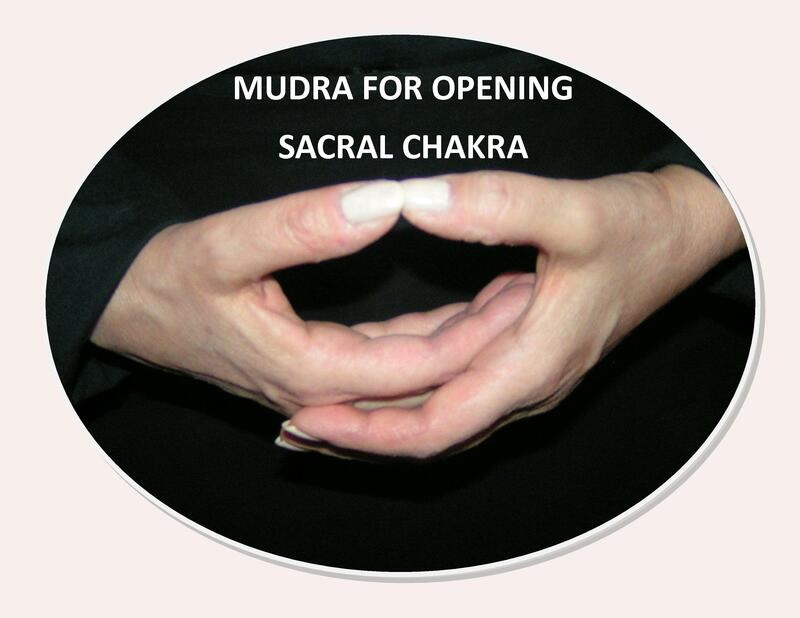 Clasp your hands with fingers crossed inside and left thumb underneath the right. Raise your ring fingers to form a crown. Raise your hands over your head, in front of your solar plexus, or rest them on your lap. Inhale deeply and as you exhale chant the mantra NG three times. (suggested musical note- B). Be sure to post your feedback- looking forward to your experience. 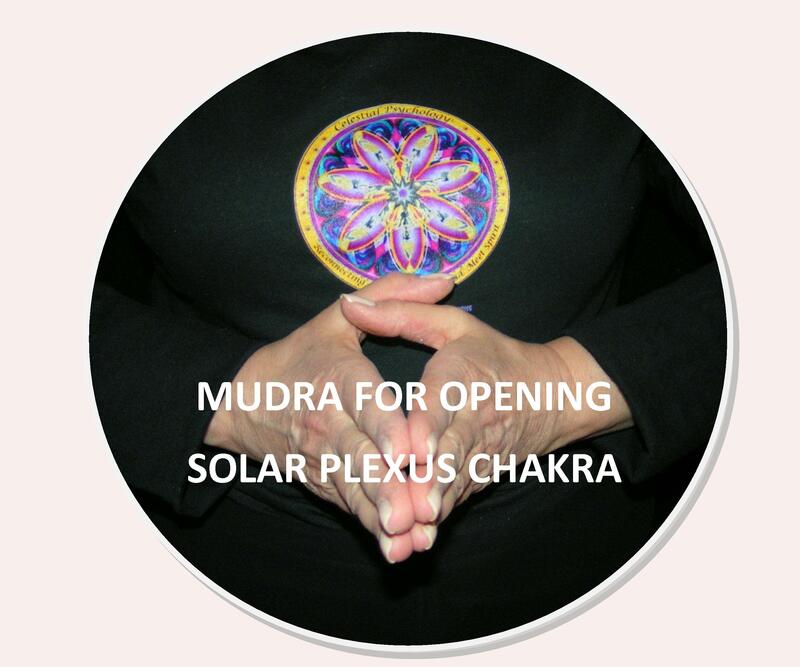 This entry was posted in Birth 2012, Celestial Psychology, The Center for Holistic Empowerment, The Shift and tagged #Barbara Marx Hubbard, #Crown Chakra Mudra Image, #Heart Chakra Mudra Image, #Images for Chakra Mudras, #Mudras, #Root Chakra Mudra Image, #Sacral Chakra Mudra Image, #Solar Plexus Chakra Mudra Image, #Third Eye Chakra Mudra Image, #Throat Chakra Mudra Image, Celestial Psychology, Chakras, Consciousness, Consciousness Raising, New Age, Spiritual Empowerment, Spirituality. Bookmark the permalink. Itis just superb. Thanks for sharing. thank you for the feedback savita! Is there any duration to use it in daily base yoga ? This is an excellent question, Tejas, thank you. I am planning to prepare a separate sound track of Baird Hersey’s “Waking the Cobra” chakra tunes- with each one repeated to last seven minutes. There were some classes when I just kept playing the same track a few times- especially chakras 2 and 5 because they are too short. Hope this answers your question. Enjoy and Namaste! Reblogged this on Tarot with Victoria.